I've been thinking about herbaria for several weeks now, ever since I went to an all day seminar put on by the Indiana Native Plant and Wildflower Society (INPAWS) a few weeks ago. A herbarium is a collection of plant specimens that have been pressed and preserved, flattened on to sheets of paper, with notations on where and when they were found. They provide a good historical record of plants if well done and well preserved. There were two speakers at the seminar, both botanists, who talked about how they use the plant specimens in herbaria for their research. In particular, I was fascinated by how each plant specimen shows us how a plant used to be, and if the collector made good notes, where it was when first discovered and collected. These thoughts of herbaria plus the upcoming holiday season, led me to wonder what a native Euphorbia pulcherrima, the Christmas poinsettia, looks like and if there are collected specimens in herbaria around the world. Surely there are. I would love to see one. I'm certain that where poinsettia grows wild it comes in one color, red, and not the wide variety of colors that breeders have developed over the decades. I'm also guessing that the bracts surrounding the flowers are not quite as full and large as the cultivated poinsettias. And definitely wild growing poinsettia haven't been all tarted up with glitter and infusions of blue and purple dyes. I looked and looked online and found one picture of a collected specimen of E. pulcherrima, but it appeared to be from a specimen growing in Hawaii in 2004. Poinsettia are actually natives of Mexico, not Hawaii. "Phooey", as my friend Gail who sponsors Wildflower Wednesday on her blog, Clay and Limestone, would say. It looked like a Christmas poinsettia. I decided to continue my quest by searching through books on Google to see if there was an old book that included a picture of a native poinsettia. No such luck, though I did find a lovely book, Our Garden Flowers: A Popular Study of Their Native Lands, Their Life Histories and Their Structural Affiliations by Harriet Louise Keeler (Charles Scribner's Sons, New York, 1910). You should see the cover on this book. It has gold lettering on a green background. Alas, Keeler did not include a picture of the poinsettia in her book, but did note that it was introduced by Dr. Charles Poinsett of Charleston, South Carolina around 1833. I suspect I would need to find an actual specimen in a herbarium that dated back to 1833 to get an idea of what a wild poinsettia looked like back before anyone had a chance to breed the wild out of it. Or maybe go on a journey to the wilderness of Mexico. That's not likely to happen, but what is likely to happen is that I'll end up finding a good copy of Our Garden Flowers: A Popular Study of Their Native Lands, Their Life Histories and Their Structural Affiliations by Harriet Louise Keeler and buy it. Did I mention the pretty green cover with gold lettering on it? Did I mention Keeler also wrote several other books about native plants? Did I mention this is my contribution to Wildflower Wednesday? hahaha! I had 2 botany subjects in undergrad days, and i really love it. However, our experience doing herbarium was not as exciting as the collection time. Due perhaps of our hot and humid climate, the specimen easily get molds and succumbed to easy decay. Formal herbaria are placed in controlled conditions to lessen those effects and perhaps they also treat the materials for anti decay. Regarding poinsettia, I thought it is native to us until i knew better. They have been here since we saw light, but maybe because we were colonized by those Spanish speaking countries. What i see here is a small tree or a big bush, with only very small colored bracts that expand only a bit during our colder months and long nights. Of course, i know now they are photoperiodic. If you want i can take a photo when i go home, it is in my aunts property. I found a poinsettia-like wildflower this past summer and to the best I could do, identified it as a euphorbia heterophylla, which my field guide says is "closely related" to the Christmas flower. I was surprised as I hadn't thought about a Midwest-native type. I watched it and it grew quite large over the summer. Not as attractive as pucherrima, though. I saw poinsettia trees, yup, big trees in Nepal a few years ago. I will send you a picture if you want although it does not qualify as herbaria. We have a native poinsettia here in Texas. It is a pretty little thing with just streaks of red on the innermost leaves. Although they aren't native, Poinsettias grow to be good sized trees in Hawaii. The first time I saw one, it took me a minute to figure out what it was! 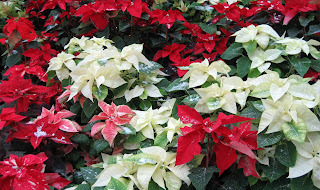 Indy's Garfield Park Conservatory has a lovely display of various Poinsettias right now. I went for the first time last Dec. A friend and I used it as an afternnon escape from the pre-Christmas craziness. It was lovely! There are two famous herbaria in our area although I have not photos or links. One belonged to poet Emily Dickenson who lived in Amherst, MA, and then Orra White Hitchock, amazing artist,botanist, teacher and helpmeet to her professor husband who acted as President of Amherst College for about 10 years. I remember seeing naturalized pointsettias in the Phillipines. They were leggy with a few skimpy red leaves at the top. Back in 1965 I was in Senegal for Christmas. My parents met me in Dakar and we visited the island of Gorée. My father took a photograph of my Mom and I under one of many Poinsettia trees. They were huge and bushy and in bloom. It took me a while to accept that that is what they were! No shiny paper or bows around those guys!!! I've never seen a poinsettia growing in the wild, but I'm sure it doesn't look anything like all those glittery, multi-colored ones for sale right now everywhere. I hope you find a picture of a native, Carol; I'd love to see it. I saw an eight-foot red shrub at Aberdare Park in Kenya. It was a poinsettia! Apparently they get huge in tropical climates, and every bit as showy as our modestly sized Christmas plants. I also saw hedges of these in Hawaii along the highways. The may have originated in Mexico, but they're everywhere now! Everywhere warm, that is.